Saqqara Newsletter 16 (2018) out now! Home/News/Saqqara Newsletter 16 (2018) out now! 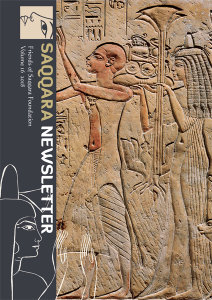 The 16th Saqqara Newsletter (2018) is printed and sent to all our Friends! Did you donate to the Friends of Saqqara foundation in 2018? Then you will find the Newsletter in your mailbox within a few days. Are you not a friend yet?! Become a Friend now! Send an email to friends [at] saqqara.nl with your name + postal address and pay the membership fee (€ 35 / Student € 17,50). For members abroad an additional € 5 will be charged for postage.